Although every child develops at his or her own pace, you can expect your baby to move through some general stages. Watching your baby reach developmental milestones can be very exciting for new parents! Whether your baby is rolling over for the first time, waving goodbye to grandma, or taking his or her first steps, you can find helpful information in the links below. Baby Development 0-6 Months – How much weight will your baby be gaining? What can you do to encourage your baby's growth? Follow this link for information on the physical, emotional, social and intellectual development of your child. 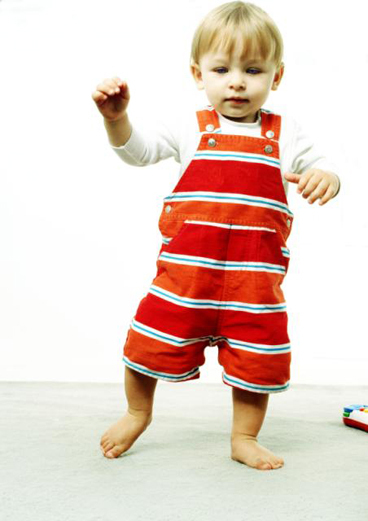 Developmental Milestones – When do most babies begin crawling? When will they hold a spoon, or stack blocks? For more information on developmental milestones, click on this link. Hearing – Learn what to do if you suspect your baby has a hearing problem. Healthy Teeth for Children – Dental health is important for babies, too. Find out about your child's tooth development and care. Infant Attachment – Learn about what infant attachment is and how important it is to the healthy growth and development of your child. Prevent Early Childhood Tooth Decay – If you are wondering how to take care of your baby's gums or when to begin brushing those first teeth, check out this Action Plan Workbook and Toolkit. Preventing Flat Heads – Some babies develop flat spots on their heads from the way they sleep. Learn how this can be prevented. Signs of Vision Problems – Your baby can't tell you if she has problems with her vision, but there are some signs to watch out for. Teething – Teething can be a tough period both for babies. Click here for some steps you can take to help your baby get through this stage in good health and spirits. Thumb Sucking & Pacifiers – The Canadian Dental Association on thumb sucking and pacifiers.